Combine the pearl barley, water, and salt in a heavy-bottom pot. Bring the liquid to a boil over medium-high heat. Reduce the heat to low, cover the pot, and simmer on low for about 1 hour. Remove the lid, make sure the barley is tender, and drain any excess liquid, if needed. Keep the barley warm until ready to serve. Meanwhile, preheat the oven to 400°F. Cut the radicchio in half, remove the core, and slice into ½” pieces. Trim and quarter the endive, lengthwise. Cut all of the quarters in half horizontally. Trim the fennel, remove the core, and slice into ¼” pieces. Combine all of the vegetables in a large baking dish. Coat them generously with olive oil and season with salt. Bake for about 40 minutes until tender and caramelized. While the vegetables roast, bring the sugar, apple cider vinegar, and water to a boil in a small saucepan. Turn off the heat. Place the shaved celery in a small bowl and the shaved radishes in another small bowl. Pour the pickling liquid over the vegetables in each bowl. Place a folded paper towel on top of the vegetables, pressing down to make sure they’re all submerged in the liquid. Let sit for about 30 minutes. Drain off the liquid (you can save this to pickle something else) and reserve the vegetables. While the vegetables pickle, combine the parmesan cheese, pine nuts, and garlic in a food processor. Pulse until finely chopped. Add in the sherry vinegar and honey. Blend until a paste forms. Slowly drizzle in the oils with the processor running, making sure to add them slowly and gradually. Blend in the water and the salt. Set aside. Lastly, heat a large sauté pan over medium-high heat. Add enough safflower oil to coat the bottom of the pan. When the oil is sizzling hot, add the mushrooms and fresh thyme. Saute the mushrooms for about 5 minutes until caramelized, lowering the heat as needed. Season with a pinch of salt. Discard the thyme. 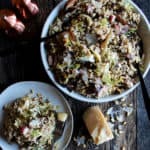 In a very large mixing bowl, combine the warm barley, roasted vegetables, pickled vegetables, pine nut parmesan dressing, frisee leaves, and toasted pine nuts. Mix well until the dressing evenly coats all of the other ingredients. Taste the salad and season with more salt if needed. Plate the salad in a large bowl or on a platter. Shave some parmesan cheese over top, and finish with freshly cracked black pepper.